Recently in the Greenhouses, the students of Hort. 485 proceeded in planting multiple plants for the newly obtained green-wall that is expected to be installed in early 2014. 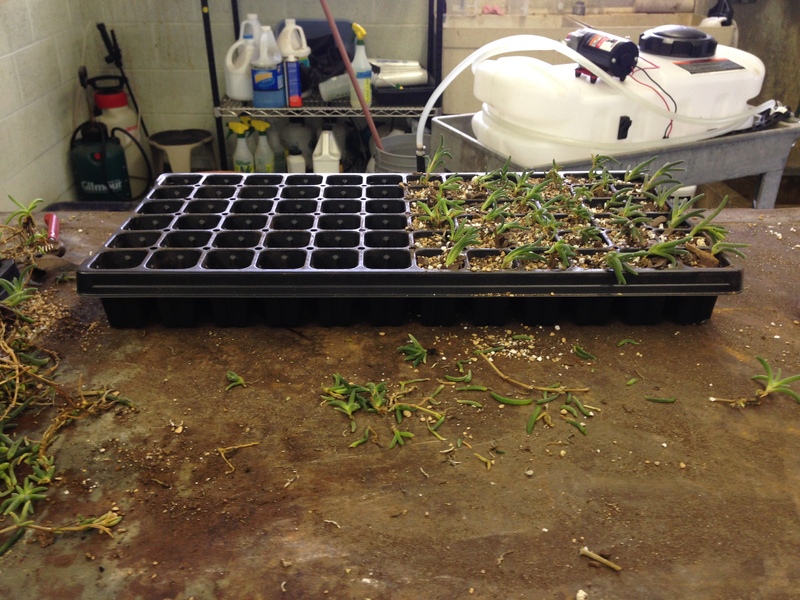 The process of planting these new plants involved cutting up larger plants into smaller stems that could be placed into small pouches. In order to maximize growth a catalyst or roots stimulate was coated on the base of each plant and was trimmed appropriately. Once it was all said and done about six different sets of plants were created with each set holding close to 72 individual plants. From there these plants were then placed in the green-roof where they will be used later next year. 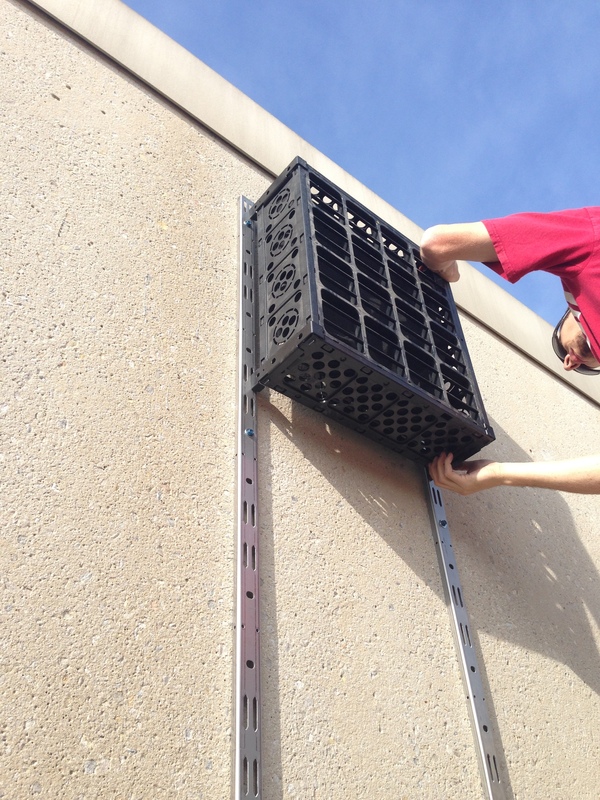 To conclude our semester working on the green roof, we begun the installation of the third green wall being included to the green roofing system. This wall is composed of modules that link to each other attached to rods into the concrete. This structure has advantages over the other two walls because the way it is designed with the individual modules, and interior soil bag. 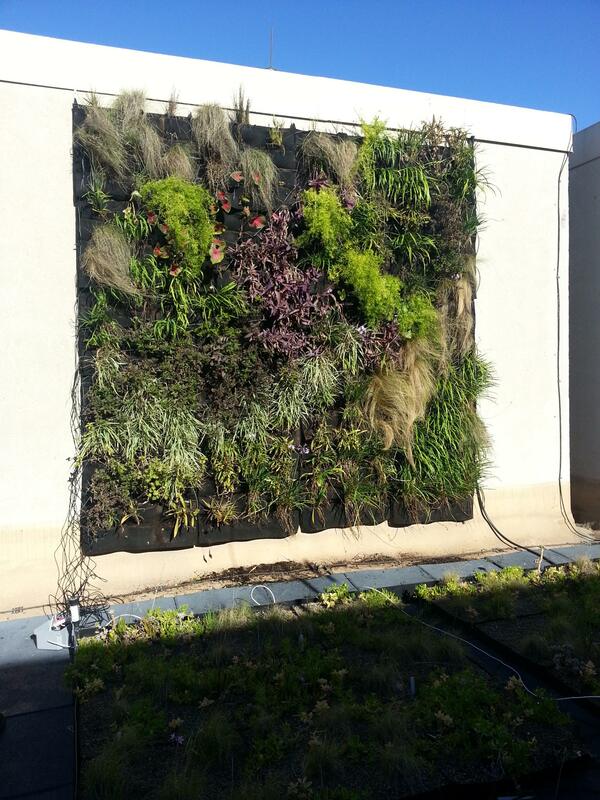 This style of green wall should also be more efficient in conserving soil, water, and nutrients for the plants. This third wall is located on a spot of the building where it will receive the least amount of sunlight compared to the other two walls currently up. This could be an advantage in order to keep the plants cooler in the summertime, but can also be a disadvantage due to lack of necessary solar energy for growth purposes. 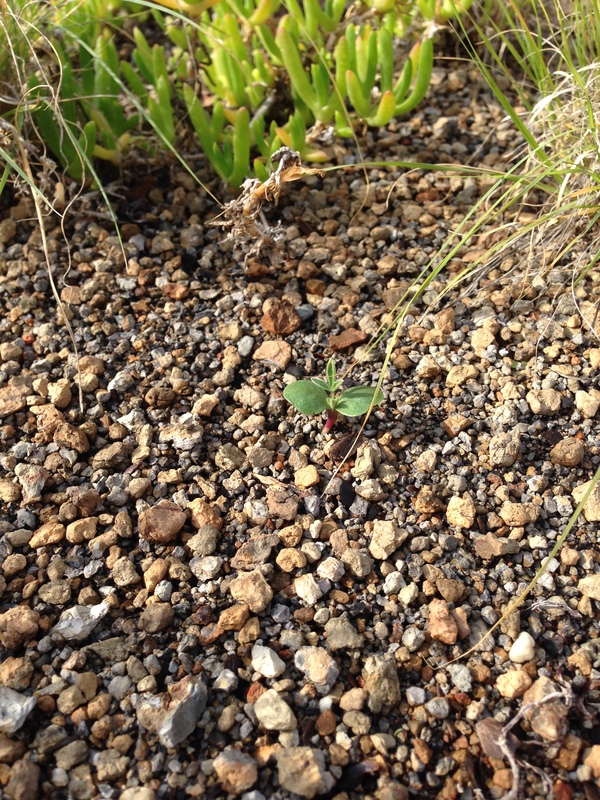 We are also starting to see some of the seeds we had planted on the ground boxes a few weeks ago sprout! Weather has not exactly been behaving in our favor to be up on the green roof recently, and we are also waiting for materials to build the third wall still, so today we stayed in the greenhouse on campus and propagated plants! I had never done this before, and I was really excited to be getting my hands dirty and doing some planting. The purpose of propagating plants today is to start the process of growing our own plants to be eventually placed in the roof system. These small plants will hopefully grow to the stage where they can either replace dead plants on the roof, or be part of the new wall. I was happy to know I was getting to work with plants that could eventually be used within the new system. 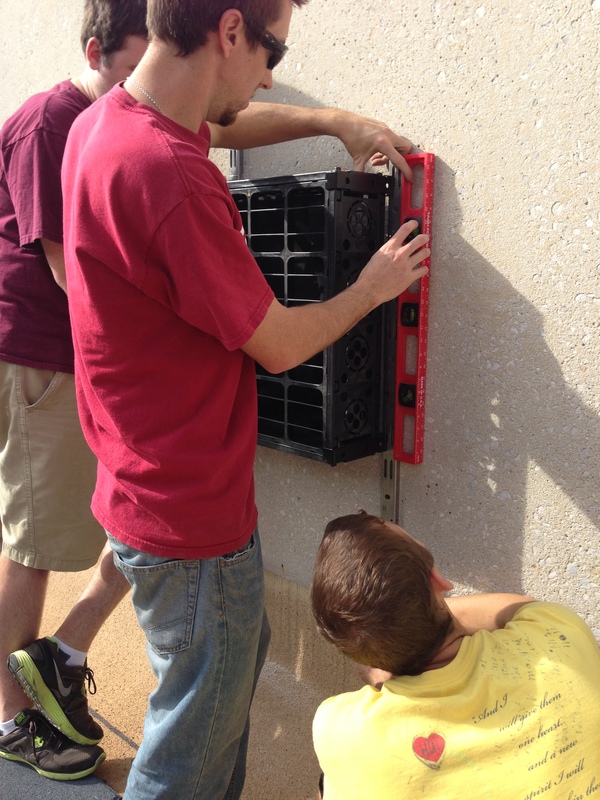 Kirk let us know today that the wall modules have finally arrived! He showed us an example of the new type of module that would be put into place, which was very different to the structure of the other two walls currently in place. Each module was built with a plastic outside with many holes for the plants to go through, with a single bag within the plastic cube in order to store soil and nutrients. It is the proposed goal of these modules to maintain soil amount, therefore maintaining water and nutrient concentrations, which will hopefully help keep the plants alive longer. During our next meet, we will begin to build the third wall! 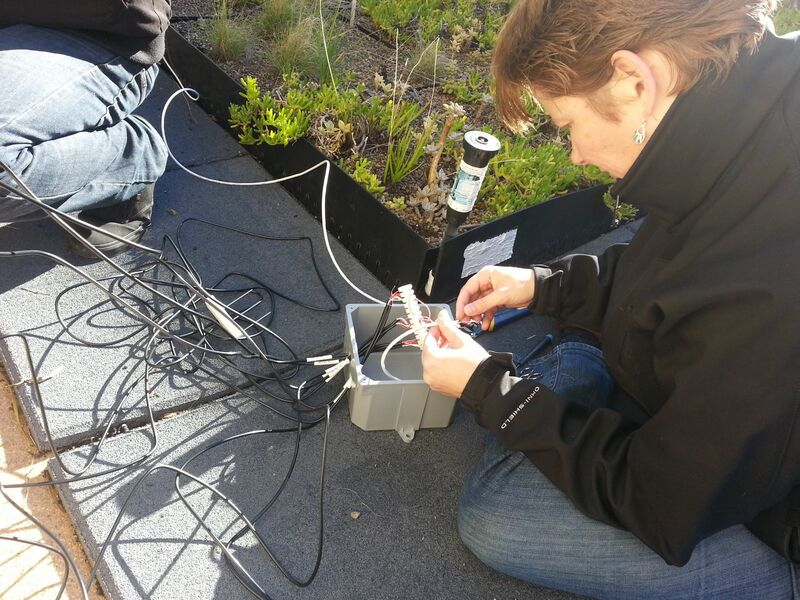 For better analysis of plant conditions, the next thing our class helped with was to install soil moisture probes on the wall modules. This was a bit of a tricky task, considering the wiring and upright vertical foundation of the wall. 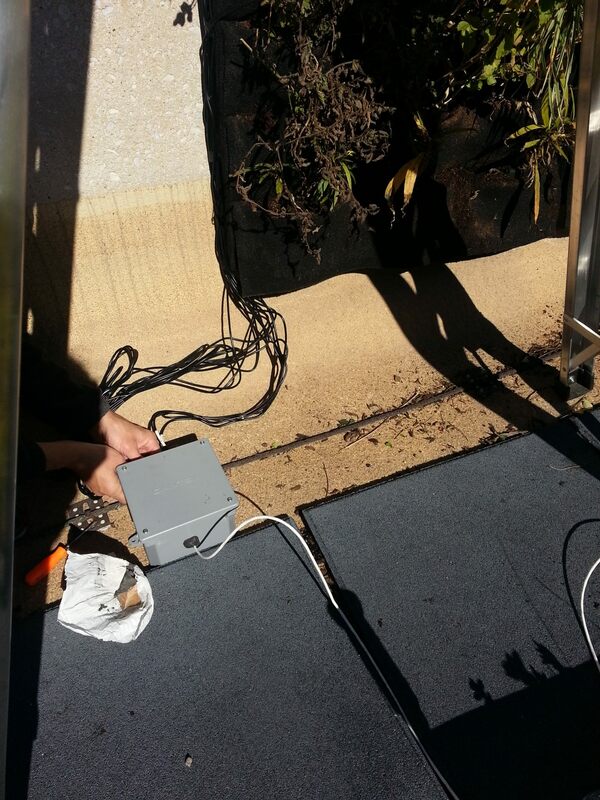 However, there are now nine installed soil moisture probes spread out on each of the two walls. To set up the electricity and recording currents to the probes, we used a connector. All nine probes have a separate wire for it individually, which routes into a box into a slot and over to another one. I am not a science or electricity specialized student and do not know the correct terminology. However, I do know it was small little bitty whole and many many wires to keep up with. I have pictures to show the creation and set-up stages of installation. 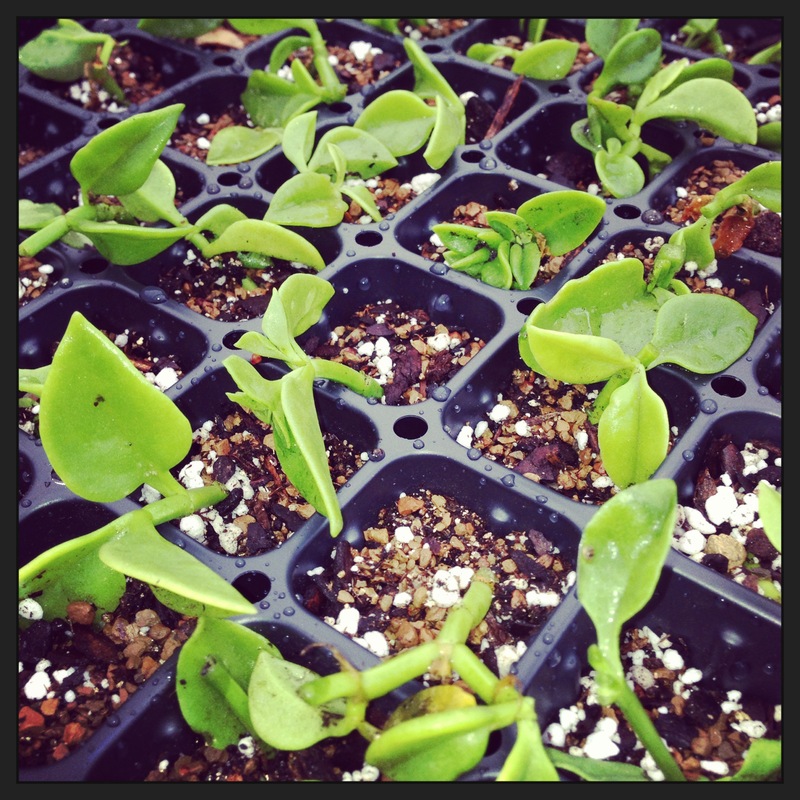 Today, we propagated plants for the green roof so that we could increase the stock of the plants. 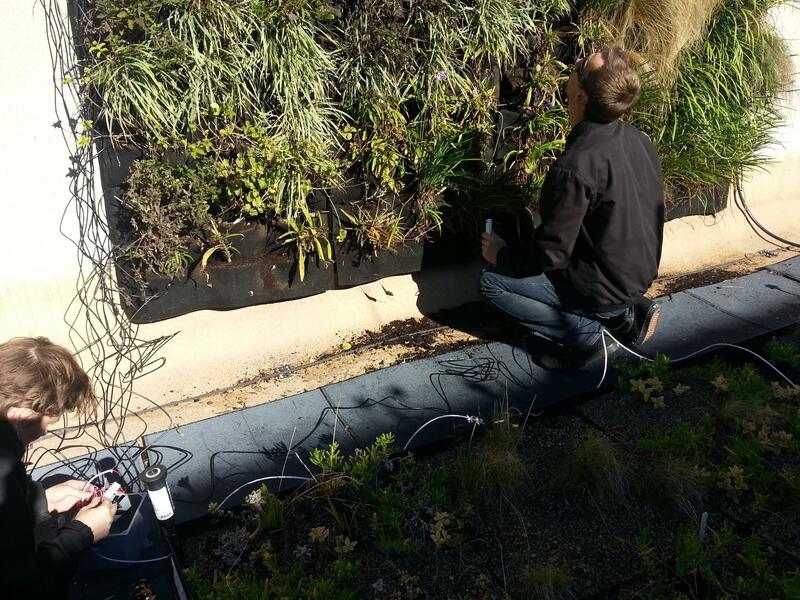 After those plants grow larger, they can be used to replace dead or missing plants on the green roof/walls, and to begin filling up the new green wall after it is installed. The new green walls system initially looks like it is going to work very well. There is one central bag in each module, which is filled up with soil. Then, slits will be cut into it where each plant is put in. The outside of the module is a harder plastic material that can be cut for larger plants or left alone for smaller plants. 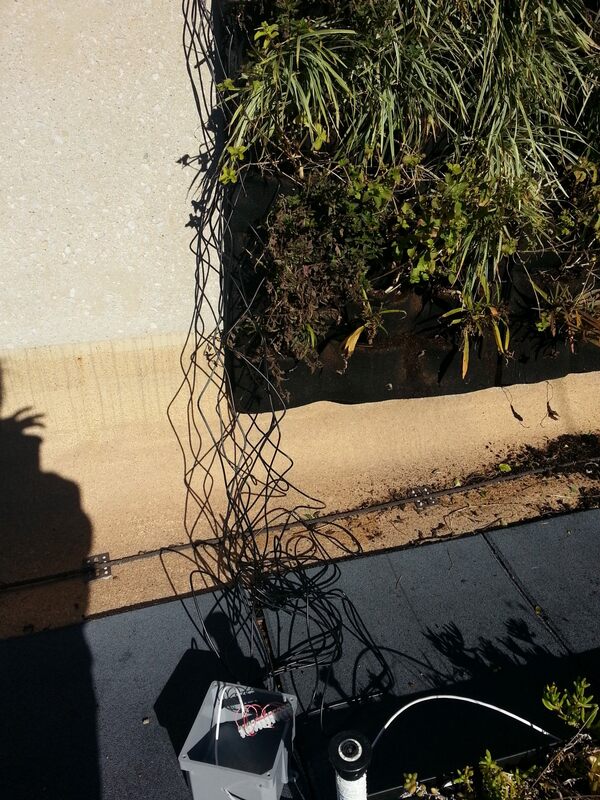 It seems that with this module we won’t have many issues holding the plants and soil in place. I am unsure of the irrigation type we will use for this new system, so that will be interesting to see. I think the most effective will probably be if we put a few sources of water through each module, rather than just one or one source at each plant; this is because the soil and plants are all held contained in one area, but if we put only one source in each of the modules, the water would probably not drip all the way down to reach the lower plants. 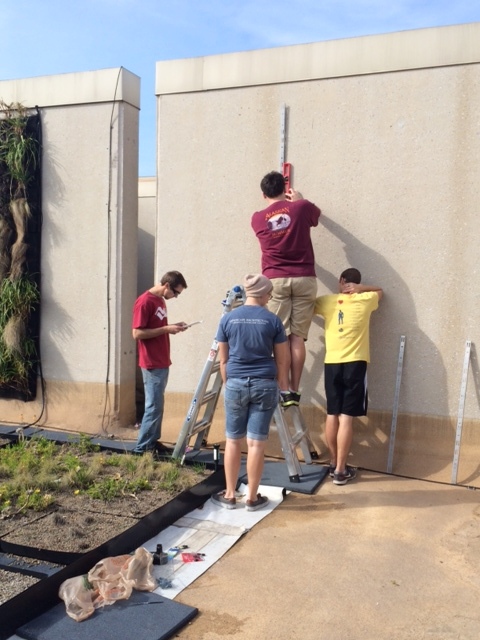 To conclude the green roof class we got to prepare for the new and improved green wall. This green wall is made up of different modules that fit together and make up a wall. This module construction makes life easier when plants need tending to, when soil needs to be changed, and checking irrigation. The new green wall allows us to be able to change the ways the wall is arranged. This can be beneficial when there is a certain area of the wall that is doing better or worse than another section of modules. 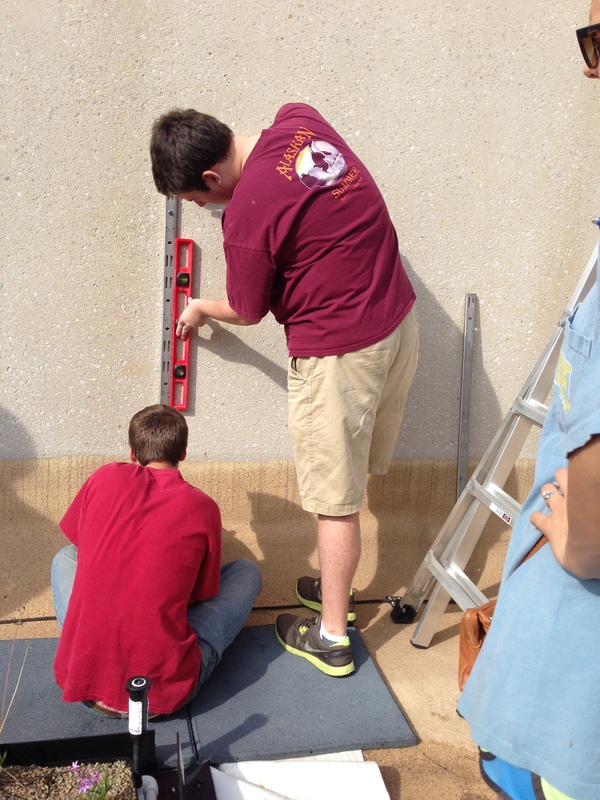 The construction of the wall started off with drilling holes into the concrete wall. We then attached the mounting rails to the wall with the given screws and bolts. We chose to use a vertical format instead of horizontal for convenience of taking down the modules. We continued installing the wall mounts and measuring out the distance of the modules between each new vertical railing. I would like to thank our 6 students that worked on the Langford project this semester. It was a successful semester and you guys worked very hard. I appreciate your enthusiasm and dedication.